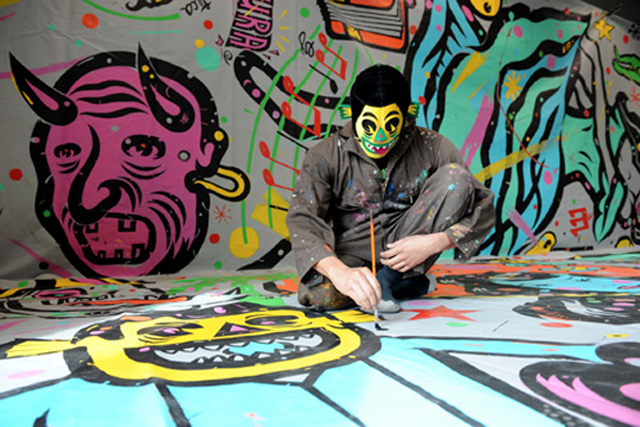 An Interview with Mexican Graphic Artist CHema Skandal! Speaking with Graphic Artist and Music Enthusiast CHema Skandal! I love your artwork’s playful, spirited – often-irreverent – sensibility. What is your main inspiration? The roots of your aesthetic? I grew up in Mexico City, and its distinct culture has inspired my aesthetic. I was influenced by everything I saw around me – hand-painted street signs, eye-catching graphic designs, everyday visual communication… Popular culture, in general, – and particularly music – is a constant inspiration. And since coming to Chicago, my work has been influenced by what I see here. On visiting Pilsen, we came upon a mural that you painted. When did you first paint on the streets? Yes, that was precisely the first time I painted on the streets. The first mural I ever did is here in Chicago. 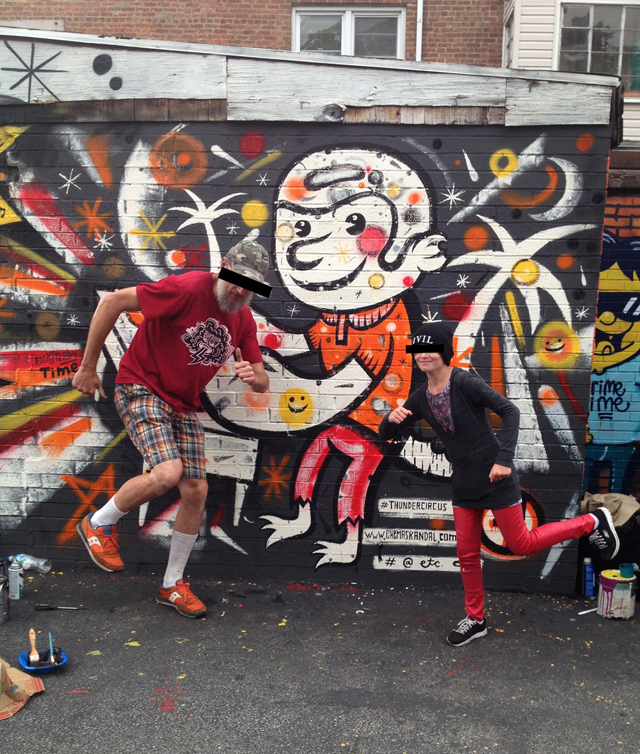 What inspired you to paint a mural in a public space? 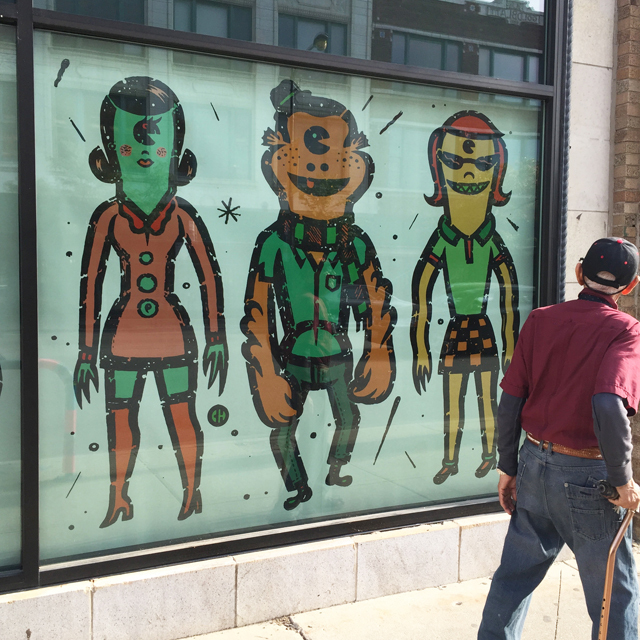 That mural in Pilsen was commissioned by a city cultural program. It coincided with me wanting to explore and try a different medium like this. At the same time I met Oscar Arriola and Brooks Golden (RIP) who brought me into street art and exposed me to many graffiti and mural artists. 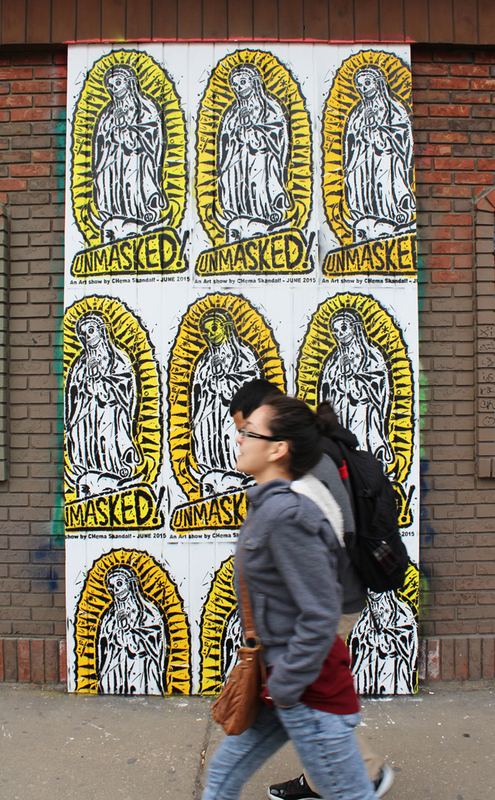 Reflecting on it, I had done some wheat pasting before while promoting concerts or sociopolitical topics. 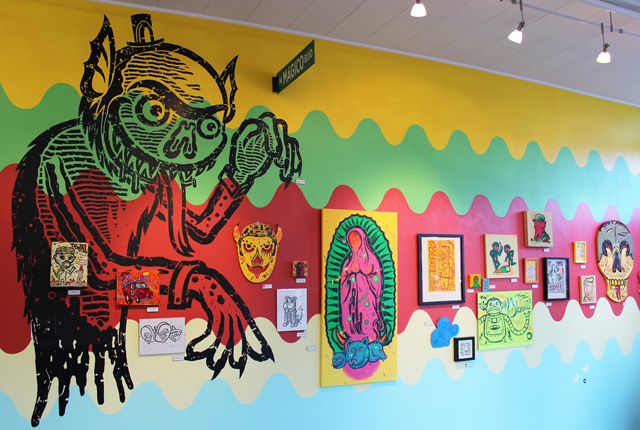 How does Chicago’s street art and underground art scene differ from Mexico City’s? A decade ago it was easy to find stickers and wheatpastings within Mexico City. 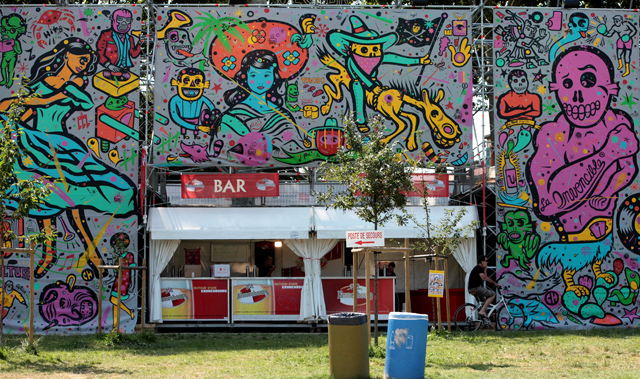 But there have been mural and graffiti artists for longer, and really good ones…mainly in the outskirts. I don’t have this background, so I can not tell you much about this, but I think in many ways they are very similar. Mexico City is one of the biggest cities in the world, so you can find practically any type of art, whether independent or more affiliated to cultural organizations or brands. I feel that the scene here in Chicago is more open. Here I was embraced and welcomed by individuals and galleries alike. Where else have you shown your work – besides here in Chicago and back in Mexico City? I’ve shown in different places, from alternative spaces and libraries to galleries and museums. Among the cities I’ve exhibited in are: Toulouse, Lyon, Berlin, Madrid, Barcelona, Addis Ababa, Kingston, Puebla, Oaxaca, Tokyo and here in the U.S. Yes. I studied Visual Communication & Illustration at U.N.A.M.’s National School of Art. I was the last one to use it! I think it can be overwhelming, but it has become a helpful platform for us artists to share our work and promote ourselves. And is your artwork the main source of your income? Yes, as of right now I am lucky my illustration work is steady. My projects range from publicity — like flyers, magazine illustrations and printed posters — to commissioned art. Almost everything I create is by hand. I work with inks, acrylics and oils. I usually start a project like that and then transfer it to the computer to finish it off. I especially enjoy the painting process. I like the organic texture of what I can produce that way. I’ve also studied traditional printing techniques. Lately I’ve been getting back into block printing, one of the first mediums I learned. I find it interesting how you can reproduce prints and also the history of it. Any favorite artists? Artists who’ve influenced you? I like and admire many, mainly for their unique way they represent their visions. 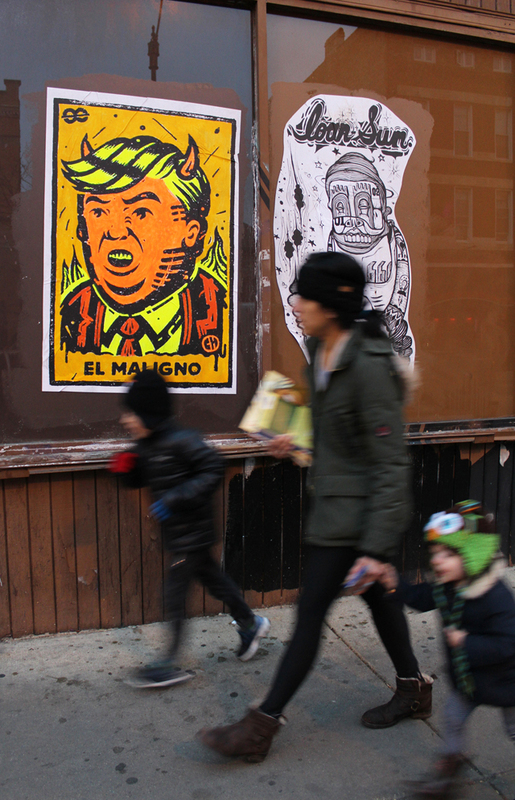 Among my favorites are: the late Mexican artist Jose Guadalupe Posada; the American comic artist Charles Burns and the satirical street artist Banksy.. I also like American and Cuban poster makers from the 60’s. I think as an artist you are always learning from others. I’ve discovered work that inspires me and makes me want to emulate a technique and try it. Most of the time during this experience you find something that fits your work, like with street Aart in my case. I am still exploring it. My work has changed, and I hope it keeps evolving. I think an artist is an amplifier of society. Artists should stimulate the feelings and ideas that are hard to digest. This can be very subjective, of course, but in the end that is where the individual’s sensitivity should focus on. An artist should reflect on the social movements of our time. I would like to learn old painting techniques that are not in use anymore. And to find a residency in a far deserted island.